Shirts With Random Triangles: South Carolina QB Lorenzo Nunez Is An Absolute Magician, Named Starter Against UCF. 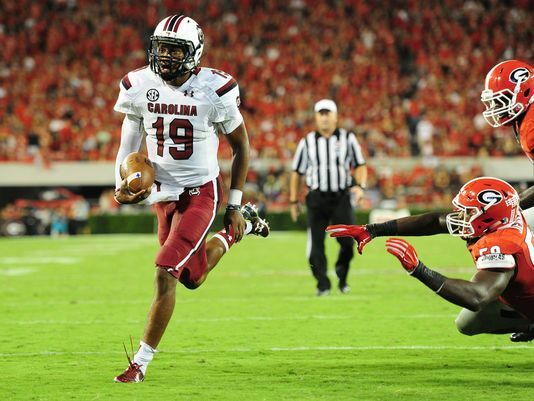 South Carolina QB Lorenzo Nunez Is An Absolute Magician, Named Starter Against UCF. Lorenzo Nunez. Image via wltx.com. South Carolina head coach Steve Spurrier is making a change at starting quarterback. Freshman QB Lorenzo Nunez will make his first start in this coming Saturday's game against Central Florida. Nunez becomes the third different starting QB for South Carolina in four games. Conner Mitch was the starter for the first two games of the season, followed by Perry Orth. Mitch is recovering from injuries received in the first two games of the season. He bruised his hip during the Gamecocks' season-opening victory over North Carolina and suffered a separated shoulder in the team's Week 2 loss to Kentucky. He was hospitalized over the weekend due to an infection related to the hip injury. Orth started against Georgia last Saturday, where he shared QB duties with Nunez. He went 6-17 for 66 yds with one interception. Nunez went 4-5 for 18 yds., with 76 rushing yds. and one rushing touchdown in the 52-20 loss to UGA. South Carolina will host UCF on Saturday. The game is scheduled for a noon start.